CU by Day: A LO with this month's freebie kit from Memory Clips! A LO with this month's freebie kit from Memory Clips! Hi all, Day here and I have a LO to share today that just cracks me up. My son (he's 5) is a natural comedian and has such funny expressions. 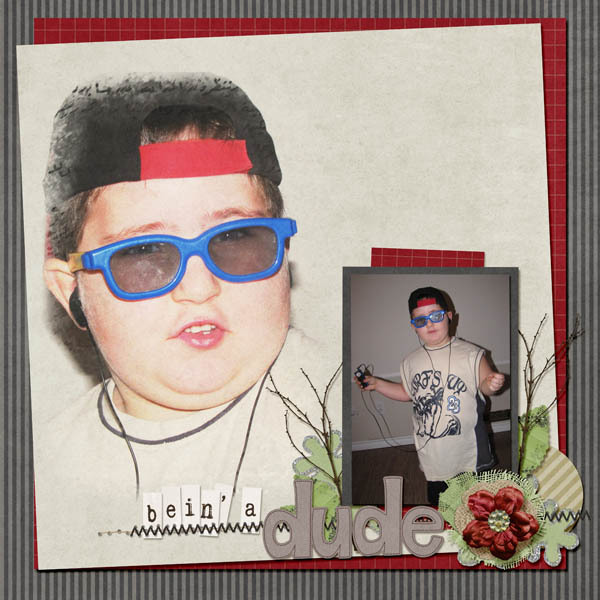 In this photo, he's "Bein' a dude"
Dudes are like a subgroup in my son's world. They seem to include anyone with a hat on backwards, or at a gym, or with a surfboard, snow board, skateboard.. or apparently anyone in bi-color 3D glasses! He'll say, "Where's my Dude hat mom?" or "Mom that teacher is a dude!" and he's also been known to stroll nonchalantly into a group of teenaged strangers at the skate park and say, "Hey dude, what's your name? I have a skateboard too... I can go down on my belly. So, can I borrow your skateboard?" He is so ate ease with others and it's fun to watch people respond to him. Anyway, he is the coolest dude of them all, and this photo is him, rigged out in all his most "dudelish" gear and rockin' out on his mp3 player.. bein' a Dude! I used this amazing Scrap Your Story kit that Ramona is giving away this month to make my page. It has tons of great elements, but I especially love the papers. I also used Memory Clips Blended Memories template pack, I love the look of one big blended mood photo and a supporting one with details, it's the best of both worlds! And don't forget to stop by Memory Clips blog every day this month to download a new part of this awesome kit every day! !